To what degree will AI and robotics be parts of the ordinary landscape of the general population by 2025? Describe which parts of life will change the most as these tools advance and which parts of life will remain relatively unchanged. These are the themes that emerged from their answers to this question. Many respondents see advances in AI and robotics pervading nearly every aspect of daily life by the year 2025—from distant manufacturing processes to the most mundane household activities. However, some experts sounded a note of concern that the gains from these new advances risk being limited only to those with the financial resources to afford the latest technologies, which may reinforce economic inequality. Depictions of robotics and artificial intelligence in popular culture often lean towards powerful anthropomorphic robots (Transformers, The Terminator) and hulking mainframes with human-like intelligence (HAL in 2001). But many of the experts who responded to this survey expect technology to evolve in the opposite direction, with machine intelligence being hidden deep in the complex workings of outwardly simple or even invisible devices and digital interactions. Other respondents envisioned a wide range of impacts that might arise from the driverless car revolution—from the economic to the cultural. As computer intelligence becomes increasingly integrated in daily life, a number of experts expect major changes in the way people manage their households and day-to-day lives. A number of experts surveyed predicted that caring for the sick, elderly, and physically challenged will be revolutionized by advances in robotics. Although most of our respondents expect dramatic advances in AI and robotics in the coming decade, some expect that these changes will occur much more gradually. 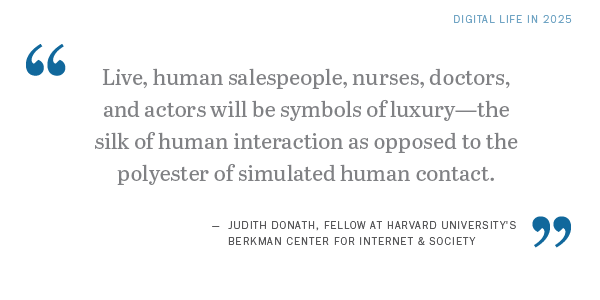 How will we interact with each other? “First, prototypes of self-driving cars are already here, thanks to Google and a few others. Driving, however, has been a human activity from the start, with century-old norms and a regulatory framework spanning global, national, interstate, state and local jurisdictions. Getting self-driving cars to work within all of that, and for regulations to adapt as well, seems a tall order that will require a lot of time and many trials and errors along the way. If it happens, 2025 is probably too early a date for seeing lots of self-driving cars, except perhaps in a few isolated geographies. So far, the strongest arguments for self-driving cars are savings and safety. So let’s say savings is covered, and the cost of owning a self-driving car is cheaper than owning a conventional one. On the safety side, according the June 2012 NHTSA Traffic Safety Facts report (pdf), 5,419,000 crashes in the U.S. killed 32,885 people and injured 2,239,000. That should make a good argument (especially around the number of crashes); but those numbers—fatalities especially—have been going down. And how much do people, or industry, actually care? Consider that the third leading cause of death in the U.S., according to the Center for Disease Control (after heart attacks and cancer) is medical error. The Journal of Patient Safety puts the medical error fatality total in the U.S. at between 210,000 and 440,000 per year. Many studies suggest that a large percentage of those deaths could be prevented with better patient information, which today is scattered among many health care providers with incompatible systems that barely communicate with each other, much less doctors and patients. Yet reform, both within the health care industry and within legislative and regulatory systems, has ranged from difficult (e.g. the Affordable Care Act) to impossible—at least in the U.S. The Web at 25 in the U.S.